By Paul Bester (T1, South Africa, first-time member) & Katie Rohwer (A1, United States, returning member). Paul Bester: The World Youth Choir session in Cyprus was catapulted into action by a string of organisational e-mails. A friendly yet firm personality wrote to us, delightfully signing off with the words, “Warmest Regards, Vladimir”. For me, this conjured up images of a master organiser: assured in his work and passionate about his communication with members. My expectations regarding the project were already rising. Many journeys of varying lengths were undertaken in order for us all to arrive at Larnaca Airport, Cyprus, the culmination of our journey – we South Africans were some of the first to arrive at the airport that day. We waited with excitement and anticipation as each member arrived from their homeland. Every new face presented an opportunity either to see an old friend again or to make a new friend for life. In retrospect, I realise to what extent this was a defining moment for us. We gathered and exchanged names and countries of origin. Some people hugged one another, some cried, but all were smiling. We greeted the hot Cyprus weather, as the group moved from the controlled climate at the airport to begin the first bus ride together as the World Youth Choir. We meandered through the lower regions of the Cypriot landscape and then started the climb up the Cypriot mountains towards our destination, Pedoulas. For the first time, we started to get to know one another, asking questions in order to hopefully find familiar ground among the jumble of cultures. I did not expect the older members of the choir to be so inviting and inclusive; I think this contributed greatly to the group dynamics and the way in which everyone was included and able to fill their own unique space in the choir. Katie Rohwer: Riding on the bus, rising higher and higher into the Cypriot mountains, I was surprised to find myself surrounded by only a handful of familiar faces. Many dear friends from previous sessions had already reached the age threshold and I realised that we would not be reunited this summer. My final session had begun. The energy on the bus was palpable and I quickly began chatting with a new member from Bulgaria. Laughing to myself, I thought, how incredible that after six years in this project I still feel the curiosity, nervousness, excitement and pure joy of meeting and connecting with a fellow singer from halfway around the world. My memory raced back to my first session and the twenty-year-old who knew only her countrymen. I marveled at how my world view, musicianship and life had changed as a result of being part of the World Youth Choir. As we went round the final bend in the road, the village of Pedoulas appeared before us and down the mountain to our right. Stepping off the bus, I embraced the feeling of having reached the culmination of my past experiences and joined in with the introductions and hugs among those reunited once again. Every year, the village of Pedoulas hosts the Summer Music Academy for the Cyprus Youth Symphony Orchestra, led by Ayis Ioannides. His vision had brought us there. The Cypriot administrative team: Nora, Ayis, Maria, Iro, Yiorgos and Tefkros, to whom we owe unending gratitude for their spirit and remarkable work both before and during the session, welcomed the choir with the effervescent Cypriot hospitality that we were to enjoy again and again over the coming month. 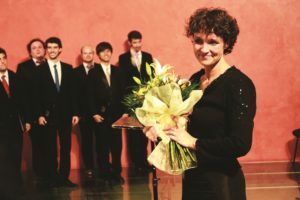 The first two weeks of the session were dedicated to an a cappella programme, under the direction of Cecila Rydinger Alin from Sweden. The second part of the session, under the baton of Maestro Ayis, involved the orchestra for the performance of Penderecki’s Lacrimosa and Beethoven’s 9th Symphony, official pieces in the programme for the celebrations surrounding Cyprus taking over the presidency of the European Council. It quickly became apparent that this was a very special group of singers. When we finally came together the following day to rehearse, the spark we had sensed earlier turned into a flame. Members both new and old seemed to arrive at the gymnasium with a united purpose: to make music at the highest level and develop musical and social connections with open-minded colleagues from all corners of the globe. A choral sound filled the space with a brilliance and clarity that took my breath away. I imagined this sound, this representation of humanity utterly connected, unabashedly proclaiming what our world could become, soaring through the windows ajar at the top of the hall and out into the pine covered mountains, surprising, and settling in the ears and hearts of, unassuming Cypriots throughout the village. Our first run-through of Poulenc’s Exultate Deo confirmed that this would be one of the most connected, artistic, motivated and inspiring sessions. The artistry and humanity we experienced in a cappella rehearsals and concerts was all thanks to our conductor. Cecilia and her selected repertoire embodied the spirit and message of the choir. We sensed the beauty of Cyprus, the ‘big, little island’, through the rich harmonies of Ildebrando Pizzetti’s 2 Composizioni Corali. The Kyrie and Sanctus from Frank Martin’s Messe challenged the ensemble and elevated our very beings. Benjamin Britten’s Hymn to St. Cecilia rounded off the first half of the programme – we referred to the text of this piece frequently throughout the session, in honour of our conductor: “Blessed Cecilia / Appear in visions to all musicians / Appear and inspire”. Ms Rydinger Alin masterfully guided us through Jan Sandström’s Biegga Luothe, Rautavaara’s Suite de Lorca and Whitacre’s Lux Aurumque. We were blessed with the opportunity to perform a Cypriot piece, In Memoriam, by our very own Ayis Ioannides. Cecilia also brought some of her favourite Swedish folk song arrangements with her, including Alfven’s Och jungfrun, Gardemar’s Slängpolska efter Byss-Kalle and Rehnquist’s I Himmelen. In rehearsals and lectures, she not only shared the Scandinavian choral tradition and her experiences with Eric Ericson, but she also taught us how to become a fine ensemble of musicians, and better people. Paul: I look up at Cecilia from my Pizzetti score and every time it feels like our eyes meet. I had not expected anything like the awe-inspiring choral sound that erupted from the bodies of the singers around me. Our voices melted together in a stream of sound that was coaxed to life by Cecilia’s rhythmical presence. Every gentle gesture and nuanced movement of her hands was skilfully interpreted by the voices of the world. During the intermission, we would break away into groups according to our countries of origin and prepare for the second half. We entered the stage when Vladimir, the choir manager, called our country, and we would bow and take our place on the stage with our comrades. Country by country, the stage would fill up to make the World Youth Choir. Each concert was superbly enhanced by the setting. Cyprus delivered jaw-dropping performance venues and we were honoured to fill them with our voices. Our a cappella performances were held in various locations across the island. The first was held in the Pedoulas Gymnasium; we sang, in gratitude, to the inhabitants of Pedoulas for their boundless hospitality. It was a touching moment, for they had opened their village to the world; such amazing friendships were formed. The second performance was held in the Paphos Odeon ancient open-air theatre, not far from the legendary birthplace of Aphrodite. I thought the absence of an acoustic space would somehow affect the richness of the sound we produced, but it seemed that even the starlit heavens were closer that night. The earth seemed to embrace us; an ancient energy was around us, brought forth by the surroundings built in the second century A.D. The third and final performance with Cecilia was held in Ayia Napa’s Museum of the Sea. 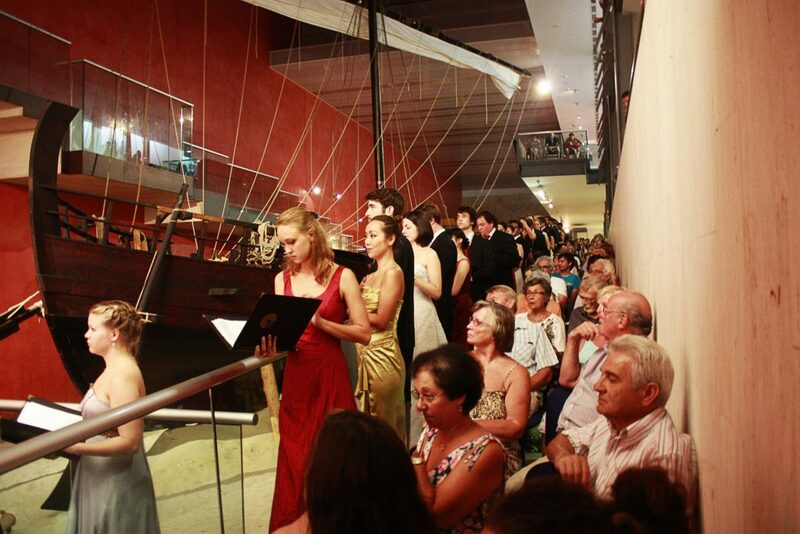 The choir was set up on a glass-floored display of ancient shipping vessels. It was very peculiar; every time one looked down at the floor, one would, for a split second, feel the sensation of floating half a metre above the ground. In front of us there was a detailed life-size replica of one of the ancient ships. An immense emotional climax was reached in Cecilia’s final words as our conductor and dedicated them to her personal hero Maestro Eric Ericson, the first conductor of the World Youth Choir in 1989. It was a moment that will stay with me for the rest of my life. Katie: After bidding farewell to Cecilia, we embarked on the second leg of our musical journey: Penderecki and Beethoven with the Cyprus Youth Symphony Orchestra. We prepared with our section leaders and in full chorus rehearsals, led by bass section leader Inaki Encina. In the evenings, the choir joined with the orchestra under Ayis’ direction. During the week, we continued to rehearse and enjoy the Cypriot summer, eating French fries and beans, hiking in the mountains, visiting the beach and exploring the 15th century Byzantine Church in Pedoulas, classified as a UNESCO World Heritage site. Many singers formed small ensembles and performed lunchtime concerts organised by the Summer Music Academy team. Only in this choir could one find a Croatian soprano coaching a Venezuelan countertenor, or Canadian, Guatemalan, American, Hungarian and Finnish singers rehearsing a quintet composed by a Bulgarian/Dutch member, or 60 people from six continents laughing, dancing and relaxing together, as if they were long-time friends with no cultural barriers between them. The choir mingled with the orchestra too, forming friendships with the instrumentalists. It was invigorating to be a part of an academy that seeks to inspire artistic excellence and cross-cultural understanding among young musicians. 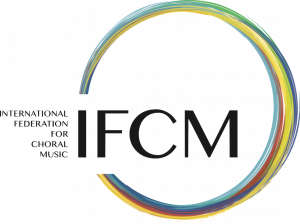 The collaboration united similar missions; both organisations are dedicated to making a difference in the cultural landscape and investing in shared cultural development. 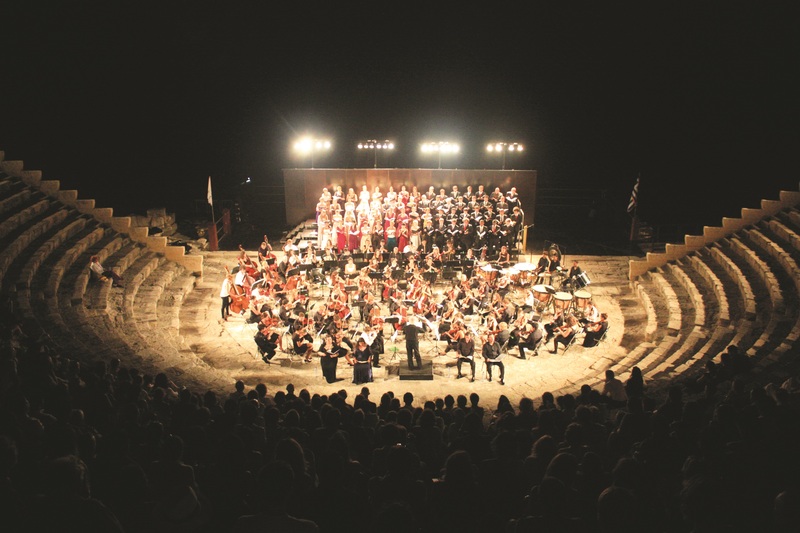 We performed three magnificent concerts, one in the ancient Kourion open-air theatre on the seafront and two in Nicosia as part of the European celebrations. Thanks to Ayis’s vision and leadership, and the inspiring text of Beethoven’s 9th symphony, the choir and orchestra came to understand what it means for ‘all men’ to ‘become brothers’. On the airplane from the United States to Cyprus, I wondered how this session would compare to my previous experiences. Returning to the States, I reflected on the power of the choral art. Perhaps it was because it was my last session, but never before had I felt so contented. Never before had I sung in such a talented yet humble group. Never could I have imagined that I would feel such a strong sense of togetherness, as though having a global family. Choral music unites us and when shared on the island of Cyprus, itself the birthplace of the goddess of beauty and love, it transforms humanity.